When you come to WSR you come to more than a church, you come to visit a family! WSR is a friendly church. 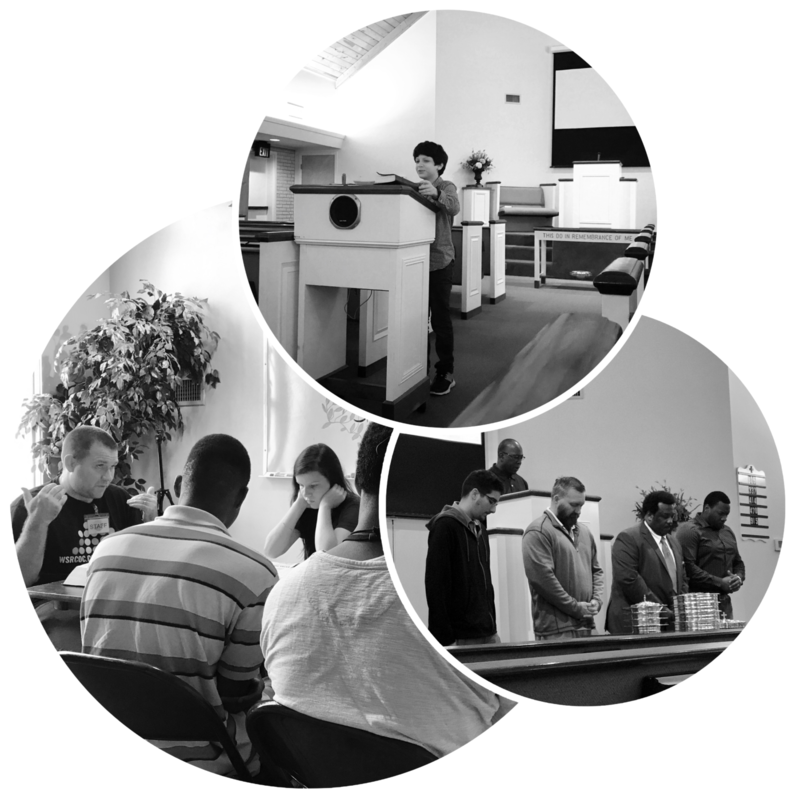 We are a diverse congregation that reflects the fact that God's church is for all people. The crowd often ranges in age from newborn babies (a nursery is available for changing or nursing moms) to those who have seen most of a century pass. Churches of Christ are places where diversified-people of all races and nationalities worship and work together as God's children (Acts 10:34-35). Guest Parking - When you enter our driveways, you will see a large paved area in front of the main door to the worship building. There are two "Guest Parking" spots directly in front of the red doors to the Main Building. If those are taken, feel free to park anywhere you wish. If there is not room on the pavement, feel free to park on the grass. Handicap Parking - There are three handicap spots located on the North side of the Main Building. If you enter via the paved driveway, you will see them on your left. Just you and a willingness to worship our Lord! If you have a Bible, you will definitely use it when you visit with us. But, if you do not have one, we will have one that you are welcome to have as our gift to you. You will see many of our members in "Dress Casual" or even some in suits and ties. But, you will also see some in jeans and a t-shirt. Whatever you feel comfortable in, wear that. All we ask is that you be modestly dressed so our worshippers can focus on what we are here to do. If you are coming for one of our Bible class times, come to the main building and we will help you find the classes that are appropriate for everyone's age. 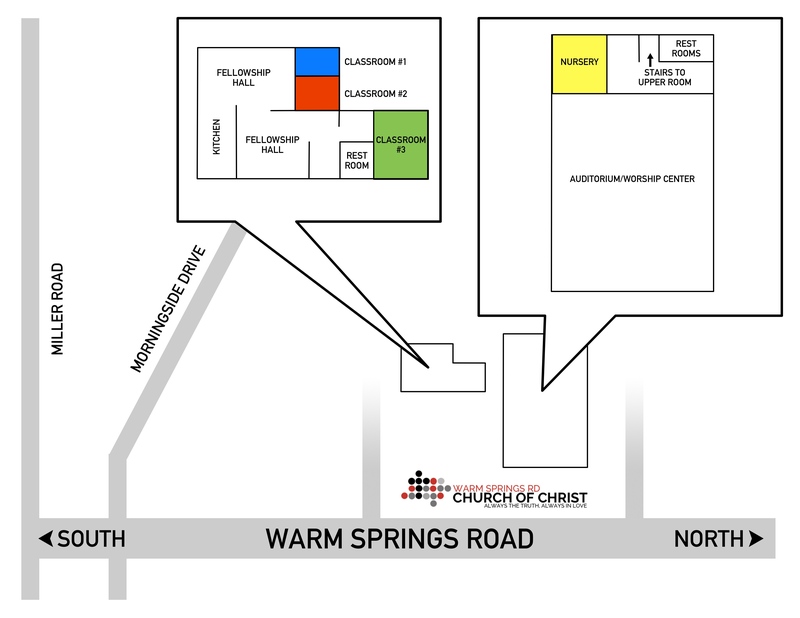 If you are coming for worship, all of our services take place in the main building in what we call the auditorium. If you walk in the main building, you will find it easily. Are People With Special Needs Welcome to Come? Absolutely! We believe all people are made in the image of God, regardless of the things they may have to do differently because of their physical bodies. It's not the body that matters to God, it's the person inside. Do You Have Children's Church or A Nursery? We love having children in our worship services so we do not have Children's Church. That is a perfect time for them to be influenced for Jesus and see their parents taking part in worship. However, we do have a nursery provided for those who need changing or feeding. Nursing moms, our nursery is not private so we ask that you stay covered just in case a man needs to come into the nursery. Simply, no. We believe in doing exactly what Jesus said, with the heart He wanted (John 4:24). Because of that, we worship the same way the early Christians worshipped - without any instruments. That means that everyone sings and takes an active part in our worship services. But please don't be nervous, we have amazing singers and some not so amazing singers. We are not worried about how you sound, but what your heart is singing to the Lord. Whether you are a new-comer to the churches of Christ or a member of another congregation but would like information on becoming a member of the Church or Warm Springs Rd. specifically, there is a check box on your Connect Card. If you will be so kind as to mark that area, someone will be in touch with you about the information you need! Do You Practice the Lord's Supper? Absolutely! It is the highlight of our worship. The time spent remembering what Jesus did for us on that Cross is not only humbling, it is extremely encouraging. If you have never experienced the Lord's Supper, it is a time when we gather to eat a small piece of bread that reminds us of Jesus' body that was sacrificed on the Cross and drink a small cup of grape juice which reminds us of the blood that saved us from our sins and past. If you do not feel comfortable taking part in this portion of the worship, just simply pass it along to the next person. Financial contributions to the work of the local church is something done by the members of that local church (1 Corinthians 16:1-2). Someone who is yet become a member of the congregation here at Warm Springs Rd. is never expected to give money either during the worship collection or otherwise. If you are a member and would like to give, you may do so online or via text message. Check your weekly worship bulletin for information. Do You Have Security Measures So My Family Will Be Safe? Yes. For obvious reasons, we do not publicize those plans and procedures but we want you and your family to know that you will be safe when attending with our church family. We understand that many are worried about situations, but we are working hard to do everything we can to make sure that everyone who attends WSR does so in a safe atmosphere. Want to let us know you are coming? Submit a Contact Form and let us know you are coming. If you need help with any special needs, please let us know so we can have someone ready to help.